Jackie Trent's best work was done in partnership with Tony Hatch who was to become her husband, but her singing career began much earlier. She began singing professionally during the late 1950s and, although she was a popular singer at the small venues she played, she remained fairly unknown nationally. Her first recordings were with Oriole, which is now a label noted for being a little more adventurous with its signings than some of the better known ones. However, her work remained in relative obscurity until she auditioned at Pye for Hatch. The couple obviously liked each other's company because they soon began working together on a number of musical projects. I presume that the photo used for the cover of the EP shown on the right must have been taken on a very breezy day. This would explain what must be Jackie's hair- somewhat out of focus- obscuring the picture a little. Anyway, this EP (Pye NEP4225)- containing and named after her great hit "Where Are You Now"- is the only one issued in the UK for Jackie Trent that I am aware of. 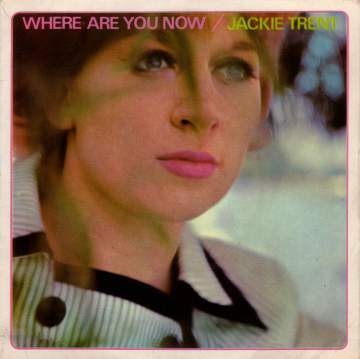 The first fruit of the new collaboration was 'Where Are You Now My Love' which they co-wrote, and which gave Jackie Trent her first and only #1. She had only two further minor hits in the UK, although her popularity and that of Tony Hatch was probably greater in Australia which was a country they frequently visited together. Although they wrote several more well known songs together they were turned into hits for other singers - in particular Petula Clark. Since then their best known work is probably the composition of the theme tune for the Australian soap 'Neighbours'. Pye NEP24225 1965 "Where Are You Now"